Lot 593. Cn. Papirius Carbo. 121 B.C. AR denarius (20 mm, 3.85 g, 8 h). Rome. 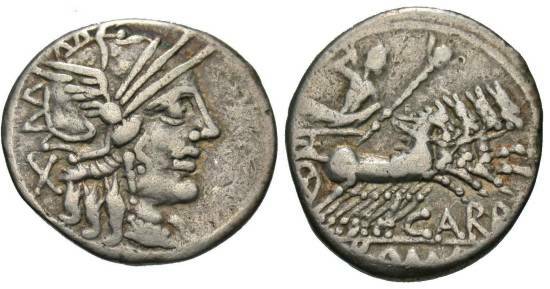 Head of Roma right, wearing winged Phrygian helmet; X to left / CARB //ROMA, Jupiter driving fast biga right, brandishing thunderbolt and scepter. Crawford 279/1; Sydenham 415. Nearly very fine.